We can 3D print the very small—check out these mindblowing nanoscale creations—but what about the very big? If a few bold architectural startups have anything to do with it, we may soon see the first 3D printed homes. Three otherworldly plans put forth by Universe Architecture, Softkill Design, and DUS Public Architecture include a concrete mobius strip, a weird cantilevered plastic nest, and a three-story Amsterdam canal house made of recycled bottles and potato starch. Of these concepts, the Softkill Design presents the most bizarre and darkly futuristic. 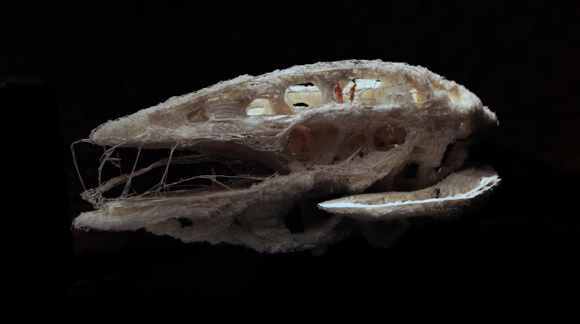 Protohouse takes its inspiration from the porous strength of bones. The design’s laser sintered bio-plastic is deposited along the structure’s exact lines of force, making it efficient, light, and strong. 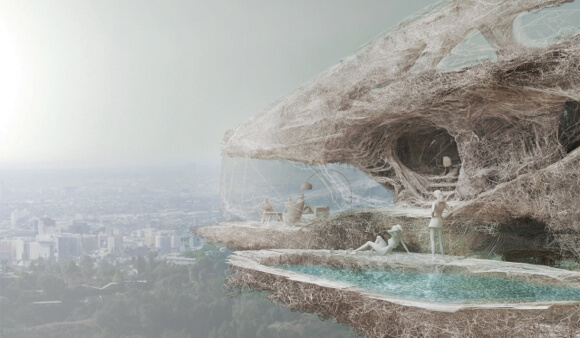 The 1:33 scale Protohouse 1.0 looks like a wild nest or funnel spider’s web. Protohouse 2.0 will be four meters by eight meters and incorporate furniture, stairs, even curtains into the print design. The architects say they’ll print 31 truckbed-sized pieces offsite over three days and snap them together (no welding, no adhesive) onsite in a day. They hope to have their first unit complete this summer. Meanwhile, Janjaap Ruijssenaars of Universe Architecture wants to print a concrete house shaped like a mobius strip (a 3D geometric shape with no beginning or end). Ruijssenaars will use the world’s biggest additive printer, the D-shape, to print framed sections into which they will pour concrete and fiberglass. As Gilles Retsin of rival, Softkill Design, points out, it’s not a fully 3D printed house. But it is a cool concept and may be finished in 18 months—or as soon as the firm can line up a buyer for the $5.3 million structure. Finally, there’s DUS Public Architecture. 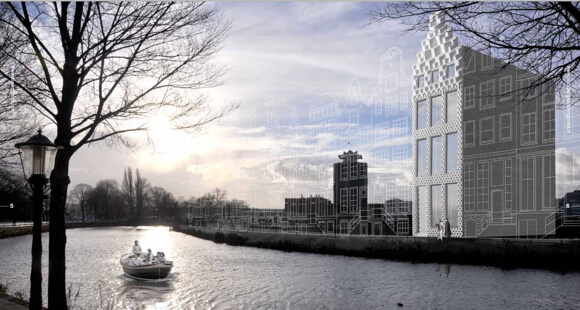 The Dutch design firm will use a mobile large-scale Kamermaker 3D printer to print and assemble an Amsterdam canal house piece-by-piece onsite. DUS hopes to begin printing the first room in the next six months and finish the full house in the next few years. More than bring a finished product to market, the team’s aim is to experiment with and provide a stage for the technology. Each room will use different material—from recycled plastic bottles to potato starch. These designs are very cool. The question is, will they really be finished anytime soon? As we’ve seen, 3D printing large-scale objects like buildings is full of unexpected challenges. Last summer, we wrote about Behrokh Khoshnevis, a USC engineering professor, and his 20-hour 3D printed concrete homes. Over a decade in the making and after a few rounds of wide media coverage, Dr. Khoshnevis’s proprietary carbon fiber cement mixture and large printers seem to be stuck building walls between five and six feet tall. Since we last covered Khoshnevis’s “contour crafting,” the site got an upgrade and a new video (see below), but plans to print a full-scale house remain largely conceptual. Back then we speculated house printing needed an ambitious startup—or better yet several—for 3D printed buildings to really take off. Ask and ye shall receive. The most striking thing about these startups is their diversity in design, method, materials, and time-frame. And instead of shooting for the moon—literally—the projects seem more rooted in current 3D printing capabilities, whether that means printing with plastic offsite instead of concrete onsite or setting expectations at three years instead of 20 hours. 3D printing may soon make the leap to full scale architecture—and whenever it happens, we can’t wait to see the designs.